It was a dark and stormy night – and I set out to write a chapter or two for the third Faukon Abbey mystery, except, it didn’t turn out that way. 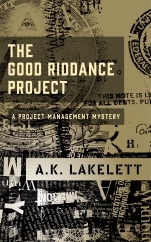 The result is “The Good Riddance Project” A Project Management Mystery. It’s a novella, and if you ever have done a project, then this one is for you. It’s a tongue-in-cheek mystery about a project manager who has issues with his wife…. 🙂 It’s now available on amazon for 99cents. Missing Alibi now out as a paperback!